Dr. Michael Mansouri was privileged to grow up around many dentists in his family. His love for dentistry grew stronger watching his uncle perform dental medicine in his office. This led him to his career path and in doing so he received his Doctor of Dental Medicine (DMD) degree from Temple University School of Dentistry in 2003. He has also completed a one year advanced training at Medical College of Georgia for Implant Dentistry. He wants to provide the best care for his patients in the most comfortable and calming environment and so Dr. Mansouri pursued additional training and is licensed to perform Conscious Oral and IV Sedation, where he can provide pain-free and anxiety-free dentistry for all his patients. During his free time he enjoys playing with his German Shepard Sir Dusty, travelling with his wife Azita, and spending time with family. He has also managed some time to learn a few golf skills. 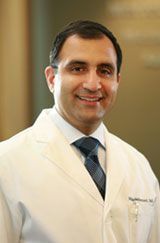 Dr. Mansouri is among the few elite dentists in his area that has achieved Fellowship status from the Academy of General Dentistry. Voted consecutively as “America’s Top Dentist” in 2011 by national poll. Recognized in Who’s Who of America’s Leading Professionals. Two year consecutive 5 star winner of Talk of The Town. Featured on the Cover of East Cobber magazine. Dr. Mansouri is also a hosting and participating member of Dentistry from the Heart; a non- profit organization that provides free dentistry for individuals that cannot afford dental care. American Academy of Cosmetic Dentistry, Georgia Academy of Cosmetic Dentistry, American Dental Association, Academy of General Dentistry, American Academy of Implant Dentistry, American Academy of Oral Medicine, Northern District Dental Society, Pennsylvania Dental Association, American Dental Society of Anesthesiology, Founding member of International Stomatognathic Honorary Alliance, and Hinman Dental Society.